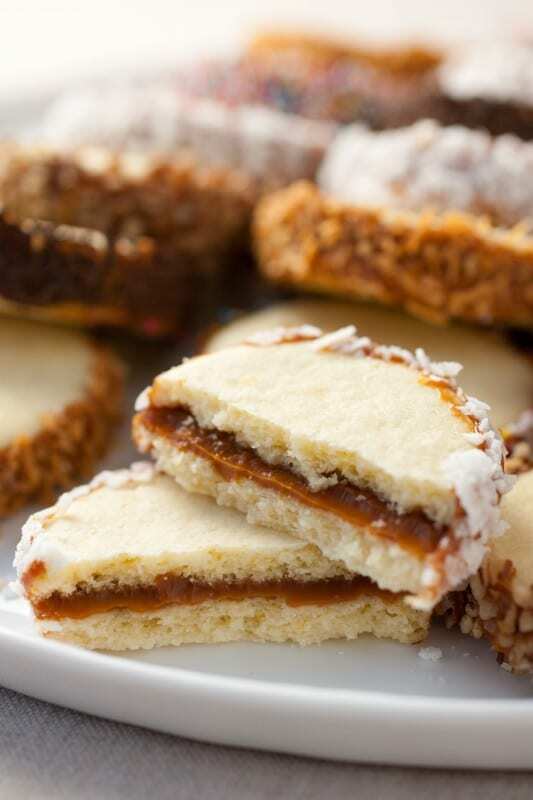 Alfajores are tender sandwich cookie filled with a layer of dulce de leche and commonly rolled in coconut. The are popular cookie found in many Latin American countries and when packaged you can often find them dipped in chocolate. These are one of my families favorites! I first discovered these gourmet confections thanks to my Husband. He lived in Argentina for two years and they were one of his favorite treats there so of course I had to learn how to make them. I can’t understand why these delicious caramel filled, shortbread like cookies aren’t super popular here in the United States. 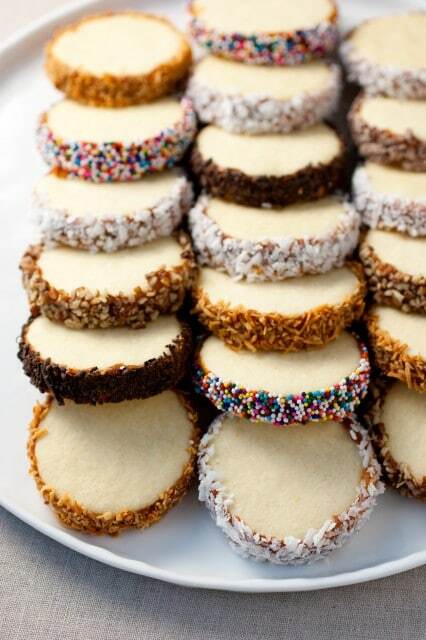 These cookies melt in your mouth! Just after adding the dulce de leche to cookies are still nice and crisp then after they rest a few hours (especially by the next day) the moisture of the dulce de leche soaks into the cookies and makes them deliciously tender. Which way would you prefer? How do You Pronounce Alfajores? Some people refer to them as Dulce de Leche Sandwich Cookies but shouldn’t we give them their proper name? Besides it’s so much more fun to say, alpha-HORE-ays vs. the other long name given. 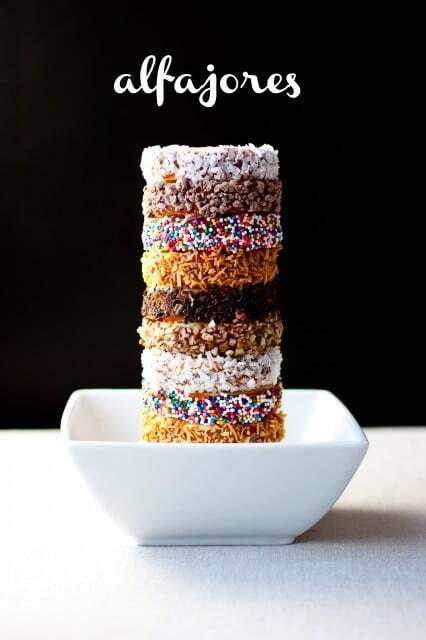 I made this recipe to be a little bit more than the traditional Alfajor. I added in some extracts and chose to add various toppings rather than just going with a plain, un-coated Alfajor. I like to give people options, and how could I leave out sprinkles? What Ingredients do I Need for Alfajores? How do You Make Alfajores? Mix in egg yolks and extract. Chill dough 30 – 60 minutes. Roll dough out and cut into rounds. Bake until set in preheated oven. 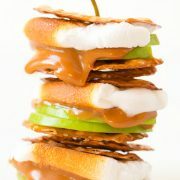 Let cool then spread with dulce de leche and sandwich with a second cookie. Roll in coconut if desired. In a mixing bowl, whisk together flour, cornstarch, baking powder and salt, set aside. In the bowl of an electric stand mixer fitted with the paddle attachment, blend together butter and sugar on medium speed until creamy, about 30 seconds. Blend in egg yolks one at a time. Mix in vanilla extract. With mixer set on low speed, slowly add in dry ingredients and mix until combined and dough starts to come together**. Shape dough into a ball, cover ball with plastic wrap and refrigerate 30 minutes to 1 hour until dough is easy enough to work with. Preheat oven to 350 degrees. Roll half the dough out onto a lightly floured surface to about 3/16-inch thickness. 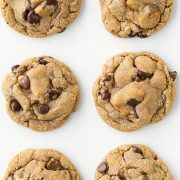 Using a 2-inch round cookie cutter, cut dough into circles then using a thin metal spatula or tall knife (such as a Santoku knife), slide along the bottom of the cutout cookie and transfer cookie sheet lined with parchment paper or a silicone baking mat. Bake in preheated oven for 10 - 11 minutes. Allow cookies to cool 5 minutes on cookie sheet then transfer to a wire rack. Cool cookies completely then spread a layer of Dulce de Leche over the bottom side of one cookie, then sandwich to the bottom side of another cookie. Roll in fine coconut if desired. Store cookies in an airtight container (I like to store them in the fridge). For a light lemony flavor, you can also add 1 1/2 tsp lemon zest along with the butter and sugar mixture. 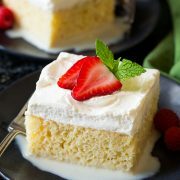 *Spoon and level flour to measure and spoon and level or pour and level cornstarch to measure. For most accurate results just measure in grams. **Dough will seem dry and crumbly at first but keep mixing and it should come together well. If not you can mix in a teaspoon or two of milk to bind. Renata Conger: I made these for a 1950’s Havana themed shower and they were delicious!